APFED’s Hypereosinophilic Syndromes Patient Education and Drug Development Conference was held March 23, 2018, in Rockville, MD. It offered a unique opportunity to learn about treatments and research advances for hypereosinophilic syndromes (HES), and to share perspectives with the FDA and other key stakeholders about the impact HES has had on on people with HES and their families, as well as learn about their views on current treatment approaches. Dynamic sessions and question and answer opportunities allowed all those who participated in-person and by live webcast to learn and share knowledge. Thank you to our education partner Knopp Biosciences for supporting the conference. Please note: The YouTube playlist does not include Dr. Klion’s presentation. We will update the playlist to include this presentation as soon as the research that was discussed is published and we are able to show the material. Please also note that polling questions and call-in instructions that are included in the webcast were only operational during the live event are no longer accessible. If you were unable to attend the conference in person or online, you can view the recordings of the conference sessions below, and on AFPED’s YouTube channel. 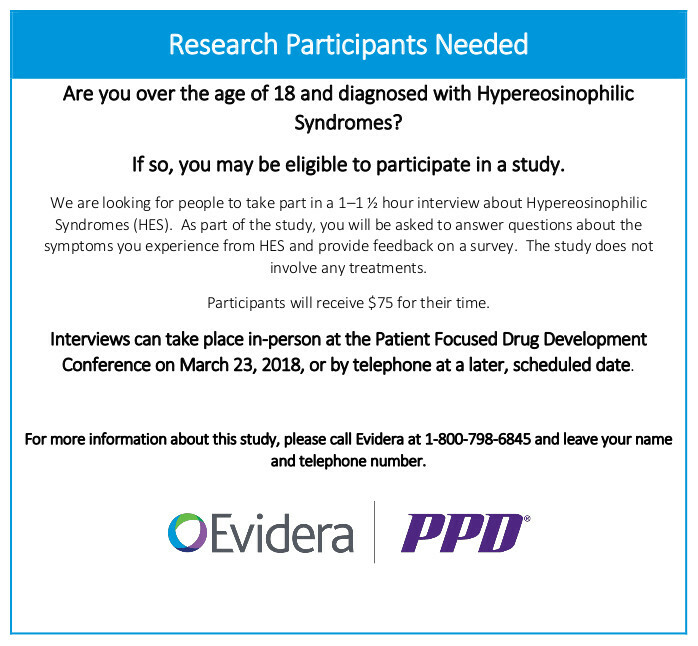 Comments from the discussion at the conference will be summarized and submitted to the FDA and other stakeholders in an effort to outline the unmet needs in hypereosinophilic syndromes. If you are a patient or caregiver who did not join us onsite or for our webcast on March 23, we still want to hear from you! You may share your perspective on the discussion topics using this form. We may choose passages from your responses to incorporate anonymously into post-meeting reports.